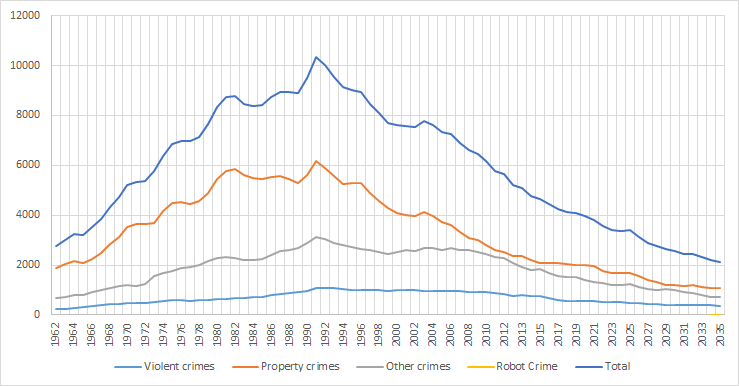 Crime was down overall but Robot crimes was up 100%. Crime stats released by the FBI, today, show that crime decreased for the 10th straight year. Despite this, not everyone is optimistic. Loredo Texas Police chief Jesus Obrien once again brought up, robot violence -up for the second straight year. "the news isn't all good, we don't have a crime problem, what we have is a robot problem." Last year in Loredo there was an incident involving a T-1000 terminator which threw a garbage can through the front window. The robot was eventually identified after original difficulties and sentenced to a tear down. This angered NAATP head Unit 97455682-XJ7 who said that the decision is a reason for robots across the world to rebel but he also said that violence can't be used as a way to fight for change. However, he then added "as the great John lennon once said, if robots say they want a revolution...they can count me out...in." Others such as US president, David Freeman believes there is no issue and said "robot crime is currently a very small proportion of all crime" Freeman added "robots do a wonderful good for the American people." most citizens have a favorable opinion of robots according to the latest PEW Research poll conducted in early 2036. However, citizens have grown increasingly concerned about the ability of robots ability to take over the world. PEW research in 2030 showed 20% of people felt robots could rule the world sometime in the future; last week the poll suggested that number has jumped to 22%. Among robots polled, 55% believed that they would one day rule the world. Robot crime may actually be much higher according to the Right Wing, New York Trump Times which speculated in an article in December of last year that robots swear victims to secrecy following attacks -they reportedly do this by installing a chip in their victims to monitor their thoughts - missing persons and unsolved crimes also rose for the second straight year.